These artificial pollinators will help us survive the bee decline. In the final episode of Netflix’s Black Mirror, the government claims to be using Autonomous Drone Insects to counteract the collapse of the bee population. Spoiler alert: they’re lying. Now, similar drones are coming to Japan, without all the government secrets and Twitter deaths (we assume). Japan’s insect-sized drones were turned into artificial pollinators with the help of a coating of horse hair and an ionic sticky gel. The drones work like bees and use their hairs to pick up pollen from one flower and deposit it into another. Researchers from Japan actually discovered this ionic gel accidentally, and then published their work in the journal Chem. Back in 2007, one of the researchers, chemist Eijiro Miyako, was working on possible liquid electrical conductors. One attempt to do so produced a wax-like sticky gel. The gel was shelved after Miyako considered it a failure. It was rediscovered after a decade during a lab cleanup and, to Miyako’s surprise, the gel remained unchanged. Miyako tested the pollen-grasping abilities of the gel by coating ants with it, which he then left to roam free in a box of tulips. Researchers observed that ants coated with the gel were able to collect more pollen than those that weren’t. In addition, a separate test applying the gel to houseflies revealed that it changes color when exposed to different sources of light — potentially giving it a camouflage effect that can help artificial pollinators avoid predators. With the gel tested and proven to be sticky enough, the next thing to do was to look for the artificial pollinator. Miyako found a $100-four propeller drone and gave it a fuzzy, bee-like exterior. It was the team’s AIST colleagues Masayoshi Tange and Yue Yu who decided to use horse hair on the drone’s surface. These bristles gave more surface area for pollen to attach to, and at the same time, provided electric charge that kept the pollens in place. 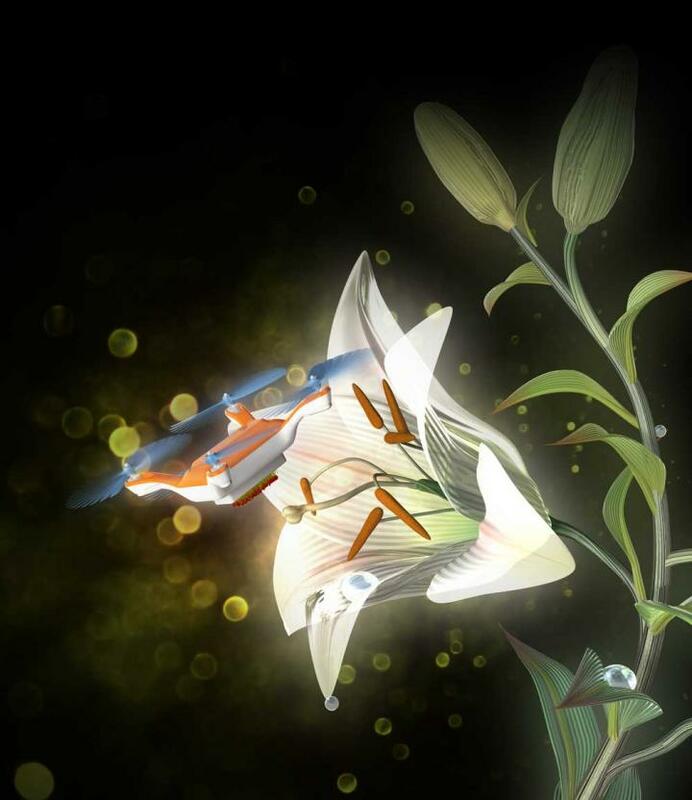 The drones were tested on Japanese lilies, with the team flying them by remote control. The drones would pick up pollen from one flower, and then flew to another flower to deposit the pollen. As bees enter the endangered species list in the United States, these natural pollinators will need all the help they can get. Artificial pollinators can lessen the burden of modern agricultural demand, giving the bees breathing space to recover their numbers. Hopefully, these drones won’t turn out to the way their Black Mirror counterparts did, but we can worry about that later. For now, getting these drones out there to see just how much they could help will keep the world pollinated.